President Obama's public statements have largely mirrored the embassy and have condemned the film in question, while defending its legality as free speech. [v] The question becomes, what exactly does Mitt Romney expect President Obama to do in this situation? Should he have endorsed an offensive and slanderous film produced by a far-right extremist? Should he have further inflamed the Middle East by issuing no apology, and potentially put more US personnel at risk? The violent reaction to the film in the Middle East is not acceptable, as violence should never be the answer, but it is hardly surprising. One need only remember the violent protests against the much-less offensive Danish newspaper cartoons, the violent response to the accidental burning of Korans in Afghanistan, and the current 3.3 million dollar fatwa against distinguished Emory professor Salman Rushdie for his novel The Satanic Verses. [vi] President Obama has not called for this film to be outlawed, nor has he attempted to clamp down on free speech. The only thing he has done is to disassociate mainstream America from an offensive and inaccurate film in order to attempt to quell the violent reaction in the Middle East and to protect US personnel stationed throughout that region. I believe that the vast majority of Americans will agree that the president is not obligated to promote the beliefs of a few far-right Christians over the safety of US personal abroad. Unfortunately, American politics have become such a toxic environment that many people simply dismissed Mr. Romney's comments as “business as usual”. Not only is this a tragically pessimistic approach, but it is patently untrue. CNN commentator John Avlon points out that during the failed Iranian embassy rescue mission ordered by President Jimmy Carter, the leading Republican presidential candidate at that time, Ronald Reagan, said that “this is the time for us as a nation and a people to stand united.”[vii] These comments were echoed by George H.W. Bush, who lost a close and bitter battle to Reagan for the 1980 Republican presidential nomination. 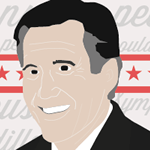 [viii] James Fallow argues that this was Mitt Romney's 3AM test, and he failed it abysmally. [ix] Frankly, Mr. Romney's actions call into question his judgment and whether he will be able to deal with foreign policy challenges that the leader of the United States will inevitably face. Francis Wilkinson suggests that Romney’s statements “may be derived from the…impulse to appease the fantasies that have taken root in the Republican base, which clings to its belief that Obama is anti-American and vaguely in cahoots with terrorists.”[x] I find it very doubtful that a man as well-educated and informed as Mr. Romney truly believes that President Obama is secretly sympathetic to terrorists. However, that does not excuse his actions, if anything it makes them even more repulsive. This latest misstep by the Romney campaign is hardly the first foreign policy miscue by Mr. Romney. Mr. Romney’s desire to prove he has the biggest balls on the playground could very well lead us into trouble with China. [xi] His official travel abroad, which included his infamous remarks that London didn’t seem prepared for the Olympics managed to turn him into a political laughingstock in Europe. His desire to constantly stand beside the current Israeli president, Benjamin Netanyahu and his war-mongering allies is almost comical. Finally, Romney's reckless and belligerent approach to the Middle East and Iran's nuclear program may very well entangle us in another war, and potentially another nation-building exercise. We have spent approximately 3.7 to 5.2 trillion dollars rebuilding Iraq and Afghanistan[xii] and lost over 7,900 soldiers from America and our allies,[xiii] yet people are still stoned in the Afghani countryside for adultery and Iraq remains a divided sectarian powder-keg waiting to blow. If America helps to facilitate regime change in either Syria or Iran, then we will be forced to partake in nation-building again. In the era of drastic government budget cuts, does anyone wish to partake in another foreign military operation? What benefit will the American people reap from another invasion? Part of being the president of the United States is being able to lead the people who didn't vote for you and to place the American peoples' well-being over that of your party and yourself. With his latest comments, Mitt Romney has proven yet again that he lacks the temperament and leadership skills to hold the highest office in our great country. Hopefully, most Americans will realize how dangerous Mr. Romney could be for the United States when they go to the polls on November 6 and select the next leader of the free world. [i] Michael Martinez and Miguel Marquez, “Filmmaker linked to anti-Islam production faces probation review,” CNN 15 September 2012, http://edition.cnn.com/2012/09/14/world/anti-islam-filmmaker/index.html?hpt=hp_t1, accessed 15 September 2012. [ii] Jonathan Alter, “To be presidential, Romney must first be truthful,” Bloomberg 13 September 2012, http://www.bloomberg.com/news/2012-09-13/to-be-presidential-romney-must-first-be-truthful.html, accessed 15 September 2012. [v] James Fallow, “Mitt Romney drops his 3 a.m. phone call,” The Atlantic 12 September 2012, http://www.theatlantic.com/politics/archive/2012/09/mitt-romney-drops-his-3-am-phone-call/262285/, accessed 16 September 2012. [vi] Nasser Karimi, “Salman Rushdie Death Fatwa: Iran Adds To Reward For Author's Killing,” The Huffington Post 16 September 2012, http://www.huffingtonpost.com/2012/09/16/salman-rushdie-death-fatw_n_1888111.html, 16 September 2012. [vii] John Avlon, “Romney foreign policy attack was disgraceful,” CNN 13 September 2012, http://us.cnn.com/2012/09/13/opinion/avlon-romney-libya-attack/index.html?hpt=op_t1, accessed 16 September 2012. [x] Francis Wilkinson, “Mitt Romney’s worst week ever: three explanations,” Bloomberg 14 September 2012, http://www.bloomberg.com/news/2012-09-14/mitt-romney-s-worst-week-ever-three-explanations.html, accessed 15 September 2012. [xi] See the previous article I wrote on “The China Problem”, http://emoryjia.org/2012/07/27/a-china-problem/. [xii] Robert Johnson, “What The Money Spent In Iraq And Afghanistan Could Have Bought At Home In America,” Bussiness Insider 16 August 2011, http://articles.businessinsider.com/2011-08-16/news/30078831_1_iraq-and-afghanistan-air-conditioning-defense-budget, 16 September 2012. [xiii] “Casualties, Iraq and Afghanistan,” CNN 16 September 2012, http://www.cnn.com/SPECIALS/war.casualties/index.html, 16 September 2012.